I wanted a pond in my garden for a long time, but I did not realize just how much pleasure it would give us. 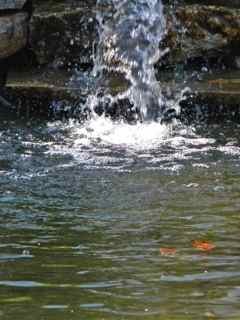 The waterfall is very relaxing to listen to, while at the same time visually stimulating. H.H. 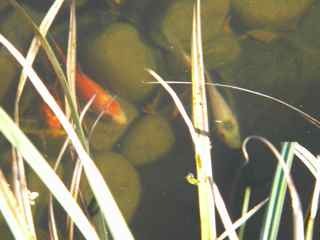 and I have a new evening routine of feeding the fish and sitting, with our after-dinner coffees, enjoying their antics. 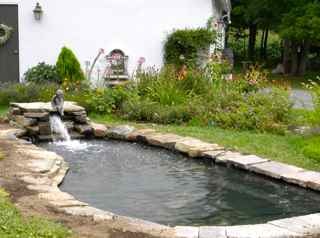 But before I discuss the joys of the fish pond further, I must show you how it was made. We decided to locate it in the cottage garden area, so it would be surrounded by herbaceous borders on three sides, with the proximity of the patio on the fourth side. 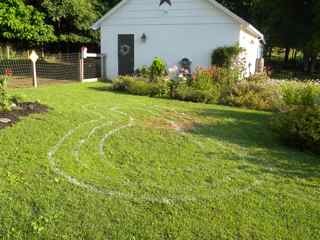 I began by marking the shape of the pond and its interior shelves on the lawn. I did a lot of reading about installing ponds so I knew we needed shelves for the plants. H.H. 's brother-in-law, Dave, opted to do the work. 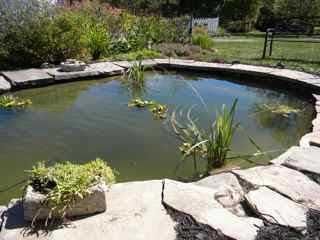 He is a building contractor, but this was his first pond. I wanted part of it to be at least 36 inches deep, for the fish to over-winter down there, so Dave decided not to dig it out by hand. 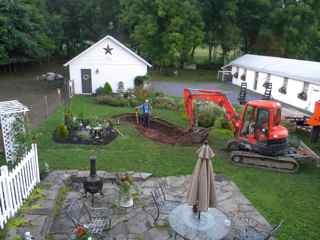 The first real drama occurred for me when the backhoe arrived ... very exciting! When the pond was dug out, Dave and his helper, Russ, lined it with sand to protect the liner from being torn by rocks and roots (of which there were many!) 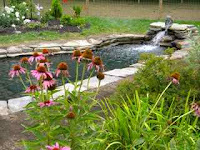 I chose a flexible pond liner because I felt it would be more natural looking. 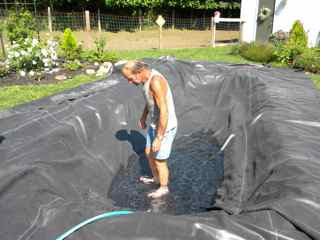 The second drama was getting the liner into the hole! It was so heavy! At this point we started calling friends and when there were about six of us, we stood all around the liner, and gradually maneuvered it over and into the hole. Well, that's what friends are for, right? 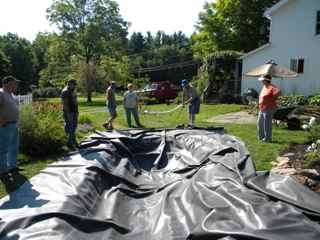 As water was slowly added, the creases were eased out, and the liner properly placed over ledges and sides. I was so glad Russ volunteered to take his shoes off ... the water was very cold. The above procedures took a few days. 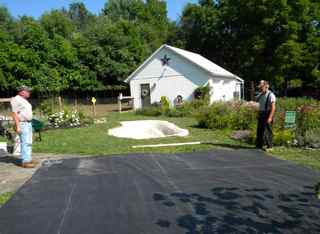 Dave starting laying Pennsylvania blue stone around the edges. Russ shoveled soil under and around the stones. The following weekend, H.H. and I went out of town to perform grandparent babysitting duties. 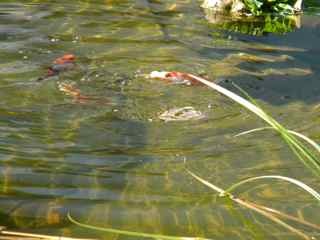 A few times, as we were enjoying our grandsons, we would wonder aloud to each other whether Dave was at the house working on the pond. 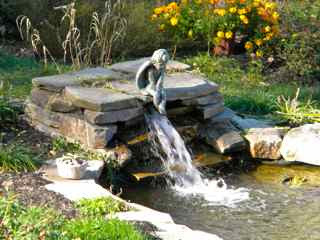 We knew he had to build up rocks to make a waterfall and install the pump and filter. The waterfall had immediate, dramatic impact on the scene. 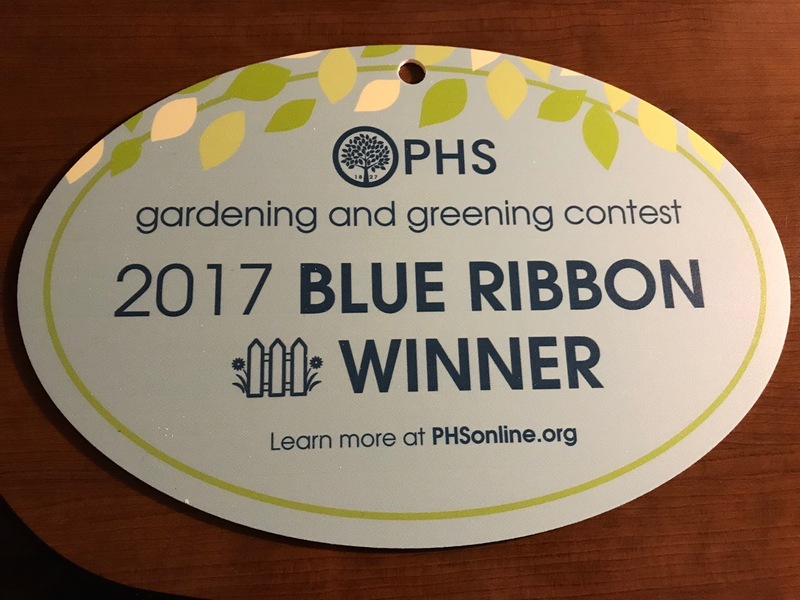 Good job Dave! 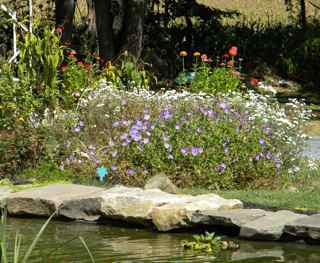 I had great fun purchasing plants for around the pond. I decided to add ground covers. H.H. 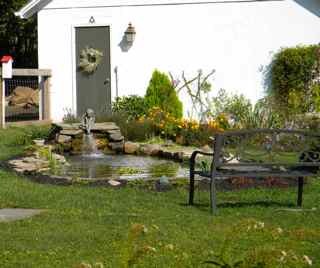 didn't want the grass up to the edging stones, because he was afraid that the grass cuttings would fly into the water when he mows. I bought two kinds of sedums, and divided some others that I had already. 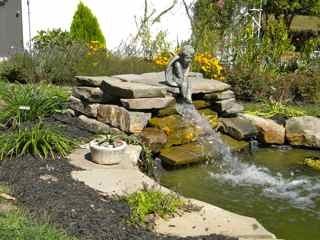 I placed lilyturf on either side of the waterfall and put a large clump at the back to hide the electrical outlet. I put some of my hypertufa pots around the edge. We didn't buy many water plants as it is so late in the year. We thought it best to wait until next spring. 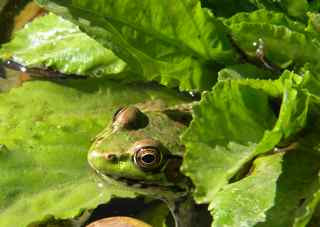 Very soon the frogs began to arrive. We have counted three so far. When the two grandsons came for a weekend visit, H.H. took them to purchase coy fish. They were told they could each pick three and they were told to pick really little ones because they were cheaper. Anyway, coy grow very fast and very big. Of course, the boys gave each fish a name. I think the two you can see below are Nemo and Walter. And it is the fish that create the most drama. They become very excited when they are fed. They race each other to the waterfall and back. They are great fun to watch! 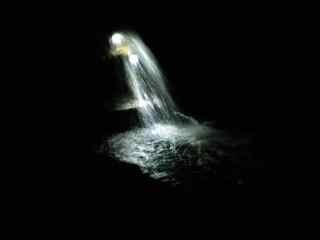 Finally, we added a couple of lights behind the waterfall. We like the way it looks at night. 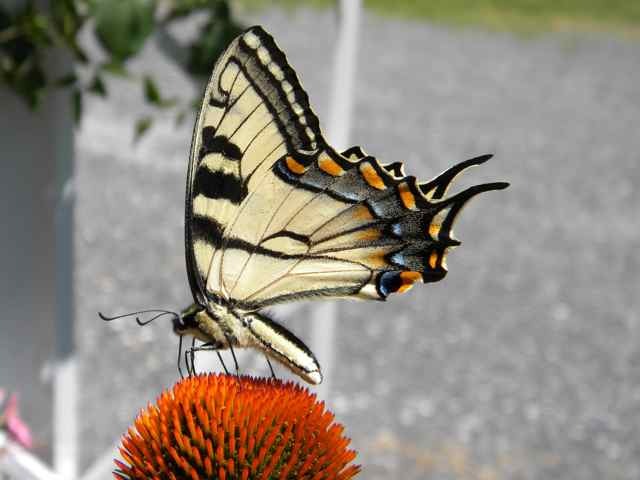 If you were to ask me what I like best about the pond, I would have to say the amount of wildlife it is attracting. 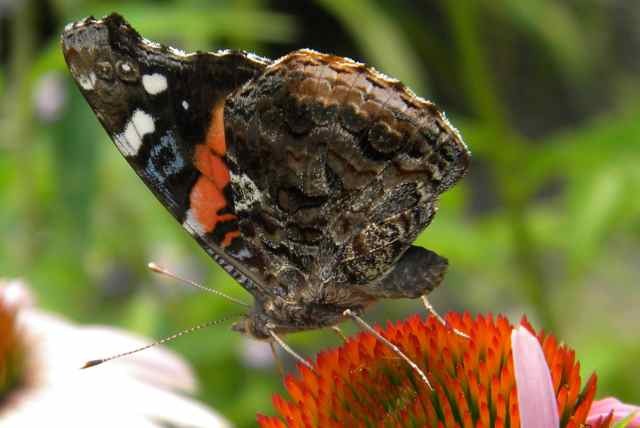 My garden is registered as a wildlife habitat but as Baines says in How to Make a Wildlife Garden, "A wildlife garden without a pond is like a theatre without a stage ... the real thrills, the real dramas of the rich habitat garden take place in and around the pond." I have to agree. 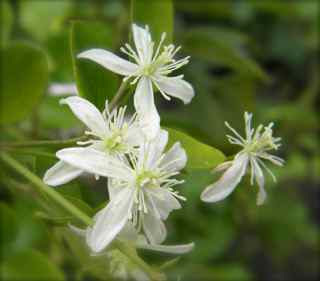 How many chances do you give a plant before you decide it has to go? I have a difficult time making the decision to get rid of plants. 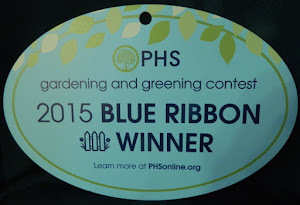 I always think next year they will be better ... gardeners are the eternal optimists, I believe. 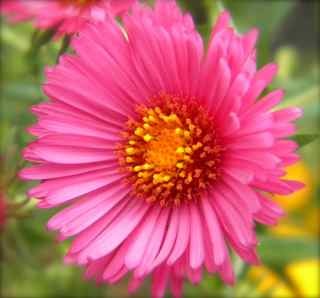 But my New England Asters, or Michaelmas Daisies as my Mother calls them, have been given too many chances. 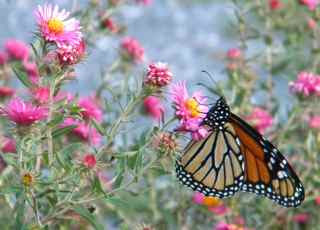 I planted five of them in the spring of 2006 and they were awesome that fall. 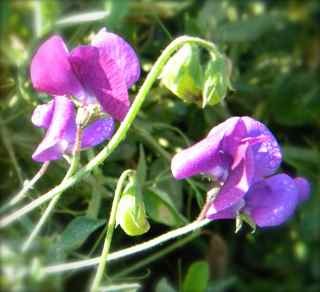 Every year since then they had a problem, including aphids and powdery mildew. This year the plants succumbed to botrytis. It began with the lower leaves turning yellow and then brown, then the remainder of the leaves died, from the bottom of the stem to the top. Botrytis does not always effect the flowers, so I spent a great deal of time grooming these plants, deciding to let them flower one more time. 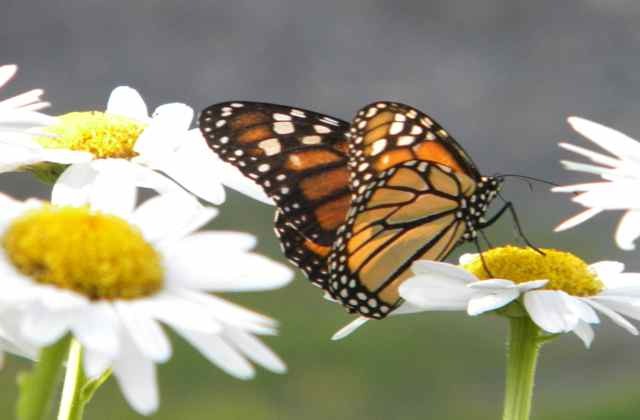 I am glad I did, because they continue to be a butterfly magnet. But enough is enough! They demand too much of my time, so when they have finished flowering I am going to pull them out. 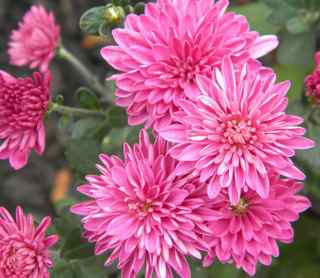 Aster novae-angliae "Wonder of Staffa"
I am giving them the final honor of being featured for Garden Bloggers' Bloom Day graciously hosted by Carol at May Dreams Gardens. In general, my garden is really winding down now and looking rather messy. 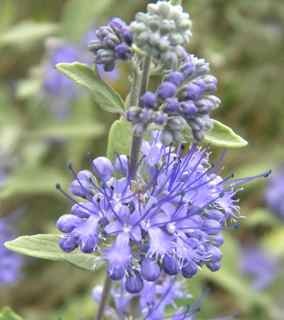 I still have a few lovely blooms, however, including the caryopteris. 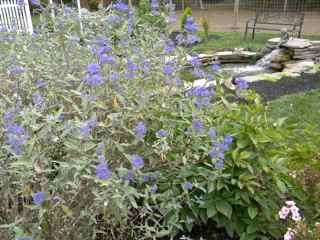 One of few shrubs with blue flowers in the fall, it is a great favorite of mine. 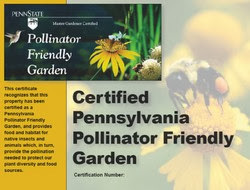 The bees love it, also. 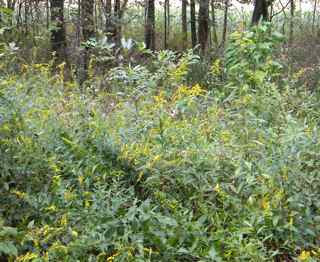 I always look forward to the goldenrod coming into bloom in the woodland garden. This year it is rather sparse, maybe because of the drought. This has been an unusual gardening year due to the weather conditions: Extreme heat and lack of rain have caused leaves to fall before the trees have the opportunity to take on their autumn colors. This is very evident in the Woodland Walk. 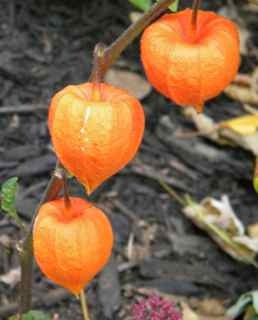 Another harbinger of fall is the bright orange of the Chinese lanterns. 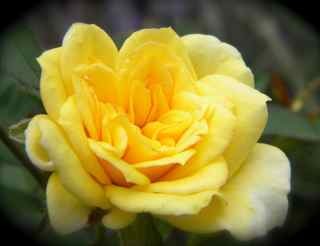 Several roses are still lovely. This is my favorite, today. 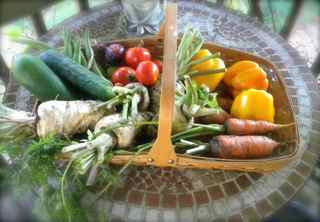 I am thrilled with today's harvest, having thought the kitchen garden had little left to offer. I picked cucumbers, tomatoes, peppers, carrots, parsnips, a red onion, and a handful of beans. 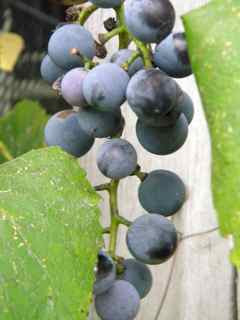 The grapes are very thin this year on the arbor, again because of the drought (I did not water them.) Therefore, I decided to leave them for the birds and not attempt to make jelly or juice. 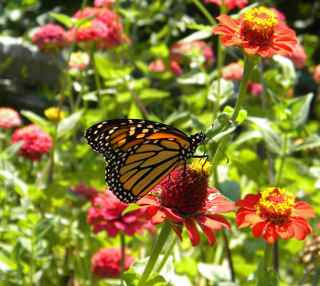 ... and the zinnias continue to put on a great show and attract pollinators. 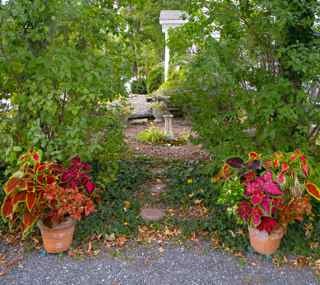 Some annuals in planters are still looking pretty, also, especially the coleus. 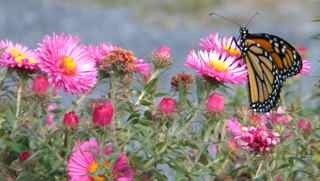 Now, I need to think of what to plant in place of those asters. What would you suggest? 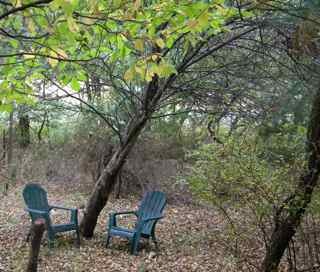 Maybe a visit to May Dreams Gardens will give us some ideas. There we can check out what is blooming around the world today. Thank you, Carol, for hosting Garden Bloggers' Bloom Day. 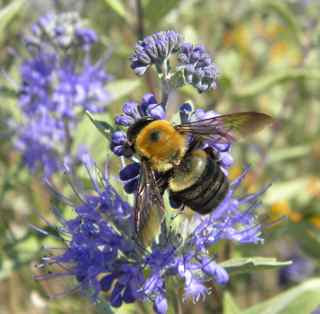 Enjoy this beautiful autumn, or whatever season it is where you live, dear gardening friends. 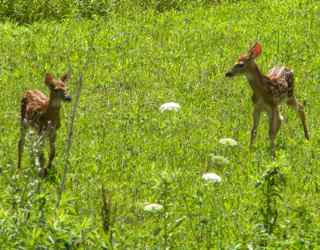 Looking through the window, early this morning, I saw some fawns in the field opposite the house. 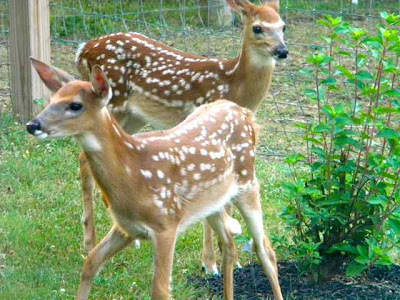 The white-tailed deer are very prolific this year. 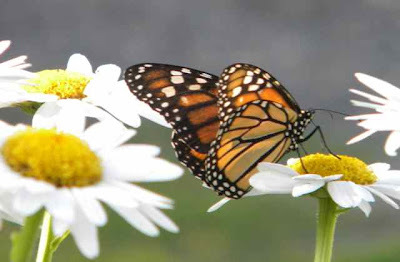 Several sets of twins regularly visit my garden. The adorable babies above are the offspring of a three-legged doe that, for several years, has often resided in our woodland walk. The two below are the ones I saw through the window, today. Their mother was nearby, but I didn't get a good photo of her. But I thought this would be a good day to take a 'critter walk'. 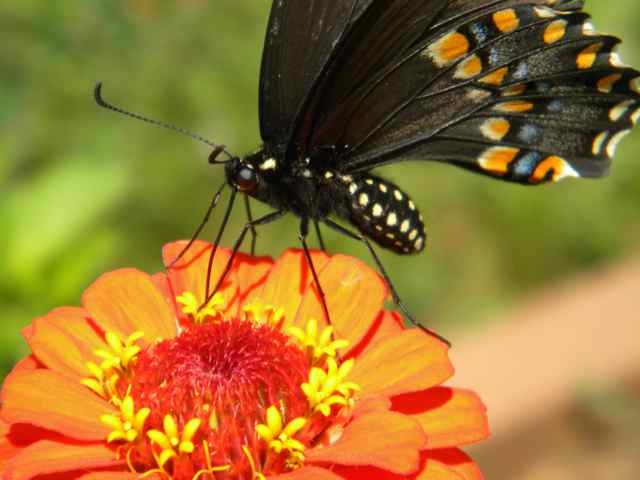 I set out with my camera to snap some pics of animals in my garden for tomorrow's Camera Critters meme hosted by Misty Dawn. H.H. tied Dude, my miniature horse, to a walnut tree on one of the lawns (free mowing ... crafty!) I was delighted to see that Dude was not dining alone. 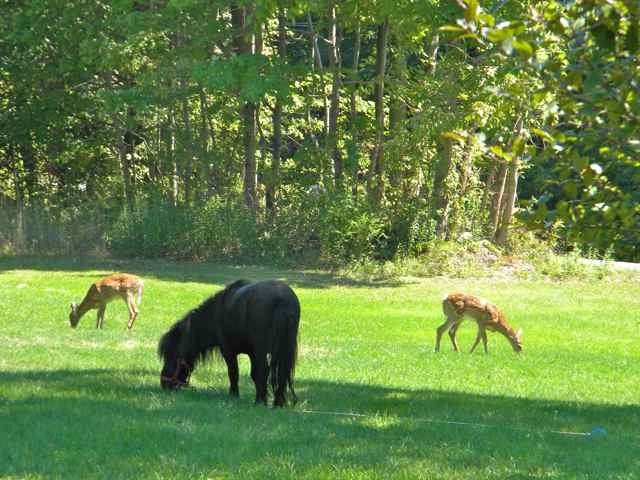 I have to say I would rather the deer ate the grass than my flowers. 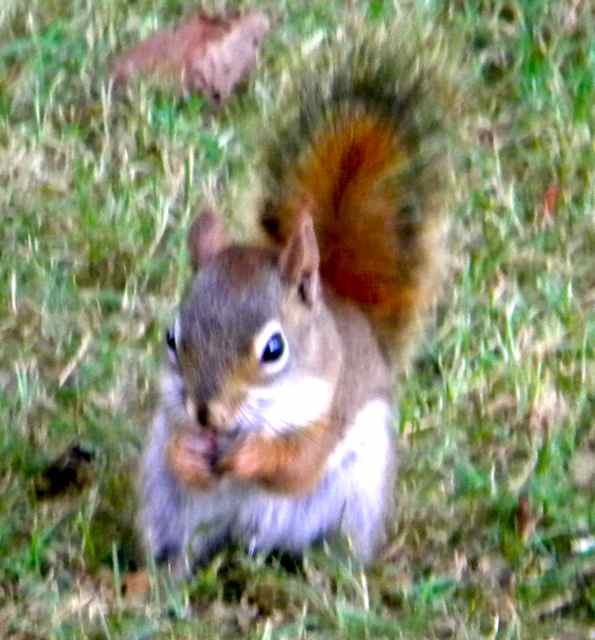 A red squirrel did not stay still long enough for me to get a really good picture (sorry this photo is a little fuzzy). Red squirrels are cuter than gray ones, but tend to be much more destructive. 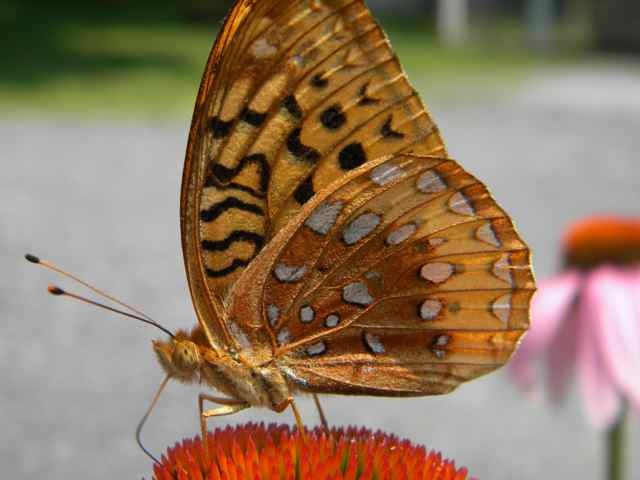 I find it is easier to photograph butterflies. 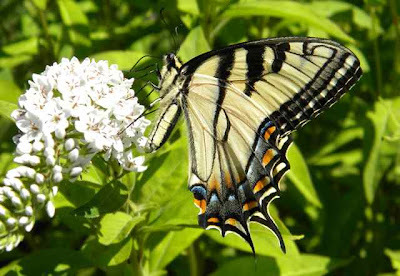 There have been many more butterflies in my garden this year, especially swallowtails. I have heard similar reports from around the country. I was very excited to find this caterpillar on some dill in my herb garden. The hummingbirds are still finding nectar in the Bee Balm. 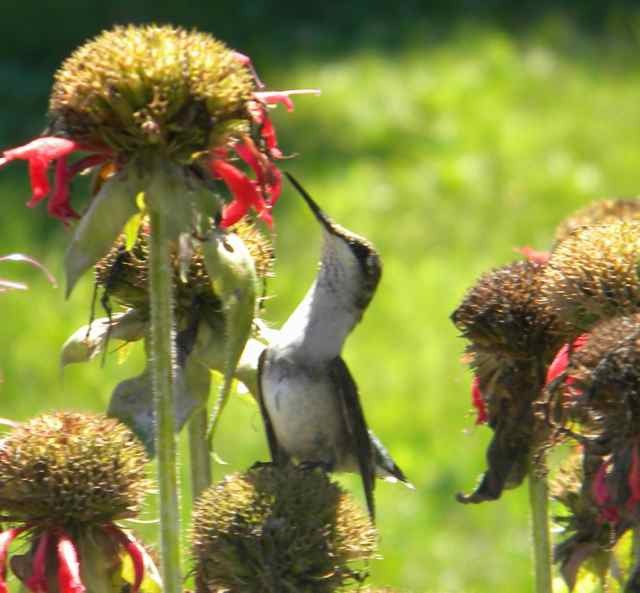 The little hummer seems to be standing on one seed head to reach into a remaining flower on another. H.H. 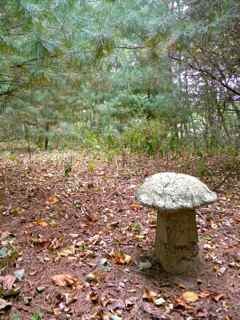 has placed numerous bird houses around the property. 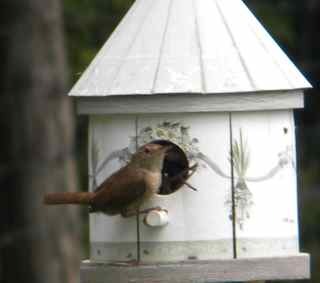 This wren house on the pasture fence is occupied by a wren family with a very late brood. There was a flock of goldfinches enjoying the seeds of the purple cone flower. For that very reason, I don't cut them back after the flowers die. 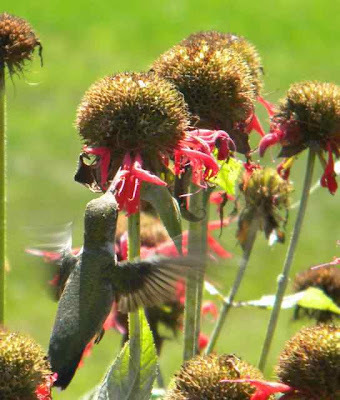 They flew off before I could get a picture. 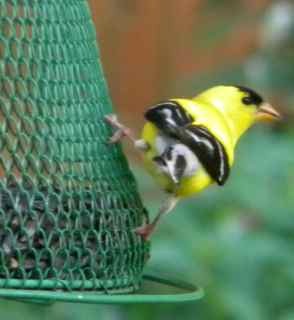 I notice many of the goldfinches are starting to get their drab, green, winter feathers. One goldfinch, still with its golden hue, preferred sunflower seeds from the bird feeder. 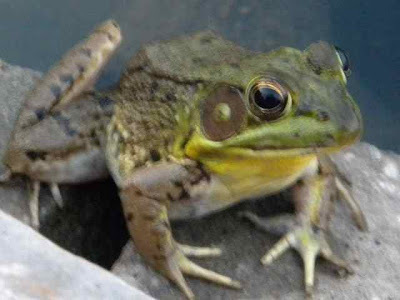 ... but he hopped into the pond with barely a splash before I could get a sharper picture. Since we installed the pond last month all types of new wild life are inhabiting my garden. I have to tell you about the pond next time. I hope you enjoyed taking this 'critter walk' with me. 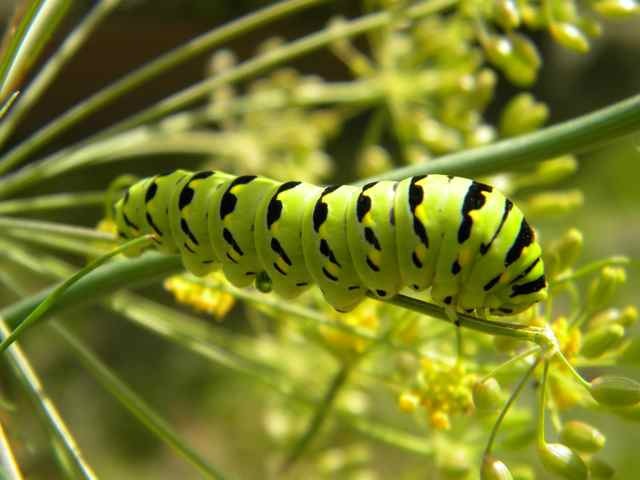 Why not join in the fun and click on the link to 'Camera Critters' in my side bar to see more fun animal pictures.